This is how you can reduce your CO2 by 2,5 tons this year. You are here: Home / Eco Warriors / This is how you can reduce your CO2 by 2,5 tons this year. Greenhouse Gases – Mea Culpa (I am responsible). I did some mathematical type calculations on my energy use and came to the conclusion that I am responsible for around 8,68 Tons of CO2 every year. I arrived at this figure by taking my average monthly consumption measured on my utility bill in kWh – or Kilowatt Hours – and divided it in half, since it takes just over 500 grams of CO2 to produce 1 kWh. So , I was using 740kg of CO2 a month. 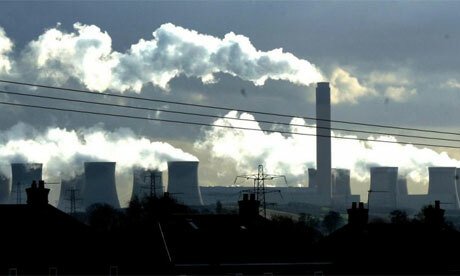 Looking at images like this one, I realised that a small part of that pollution was me! Somewhere in that ozone destroying greenhouse gas, was a batch with my name on it. Somewhere in this , your name is in there too. I made a commitment there and then to find ways to reduce my carbon emissions as quickly as possible. Unless you are completely off the grid and using solar energyand wind turbines, you are using coal fired electricity to power your home and business. The reality is that we all use this…its almost unavoidable. And that’s what I decided to do – invest in cutting my contribution to the slow death of our planet. I started by researching the average consumption for a home in South Africa and that turned out to be between 1100 and 1500 kWh…I was right in the middle! Then I started investigating the biggest consumer of electricity in my home – the one that pours most of that poisonous gunk into the air – and the winner was : my geysers. On average , a geyser will account for 40%-60% of the total electricity usage in an average home , so this is where I had to start. I put geyser timers on both geysers and now they only run for a total of 4 hours per day, instead of all day like they used to be. Also , I set them so that they coincide with when we use hot water in the house, making them more efficient. By the way , the water in your geyser will stay hot enough for a hot bath or shower for about 3-4 hours AFTER they have switched off! Then , to make them more efficient, I wrapped them both in geyser blankets made from recycled 2 L coke bottles or PET. Once I had dealt with these bad boys , I then looked at a bigger investment of adding solar evacuated tubes onto my roof that would provide piping hot water FREE to my geysers. These are simply a batch of tubes that have an effective layer film that keeps and holds the sun’s heat..then the water runs through those and the heat is transferred into the cold water- giving me hot water and giving my geysers a rest. This proved most effective , especially in winter when we used the most hot water. I was able to then have eco-friendly insulation installed that further reduced the need to excessively provide heat in the winter, as most of my warmth was not NOT escaping through the previously un-insulated ceiling. I have become an Eco Warrior. I am telling you this story because at the end of it , I was able to reduce my electricity use by around 25% and that lead to me reducing my CO2 emissions by 2,5 tons per year. I am still looking at other ways to cut this lower, and I have converted all my halogen down lighters to LED’s as well. Energy saving is an ongoing process,but as a process , it needs to start! At Saving Energy , we have provided you with many different ways to reduce your energy useage and now , as we come to winter of 2014, we are going on an aggressive drive to make a big difference in CO2 emissions. You can be an Eco Warrior. Our target is 100 000 tons of CO2 by 2015 and to achieve this we need everyone – including you- to make a commitment to investing in reducing your CO2 liability. If everyone I know and everyone you know could cut their consumption by just 20% , that would mean around 2 tons of Co2 per person would NOT be released into the atmosphere this year. And that’s by just 20%. Using a geyser timer and a blanket could save you that at least! We cannot rely on our governments to do this as they are too intimately connected with the fossil fuel industries. It is up to to us. And so , I have taken a commitment to be able to provide you with very affordable options so that you CAN make that difference this winter. Just click on the image above – the one with the crosshairs on the power station – and follow the journey to becoming an Eco Warrior. Lastly, commit to investing in reducing your CO2 emissions by taking up one of our massively reduced deals- even if you don’t get a solar water heater, or insulate your house now – start by putting timers on your geysers and wrapping them with a blanket. Doing this, you will know that the next time you look up and see the smog and pollution caused by the coal fired power stations that we are so heavily dependent on – you will know that it is a little bit less because of your action. Spread this message to as many people as you can because this is the only way that we are going to save our beautiful Earth. Click here to start your process.